King size is an ideal solution for Photographers, Artists, Designers, Bloggers & many more. There’s 5 unique full screen backgrounds you can choose from. Create your pages and/or posts with unique backgrounds, sliders, videos & much more. This template has been around for over 3 years and purchased by over 15,000 people. It is also updated regularly with the last update coming on March 15, 2014. Core is a minimalist photography, portfolio or personal website template built with the latest WordPress features including: 3 unique home page styles; full screen slide show for photography galleries, support for google web fonts, lots of admin galleries supporting multiple images upload, 4 exclusively different portfolio types, 8 custom widgets(recent posts, popular posts, twitter feed, contact form, youtube video, vimeo video, social media icon, flickr photostream), flexible page columns, many built in shortcodes, media shortcodes, custom post type support for portfolios, word press custom menu support, blog page single post & comments, automatic thumnail support, unlimited sidebar(create and set for each page), contact us page with validation and read to use PHP mailer, valid html standard & more more. Find out why over 10,000 people have chosen the core template. Photolux is an elegent & powerful Photography/Portfolio WordPress Theme which is probably best suited for photographers and creatives who want to use portfolios to showcase their works. 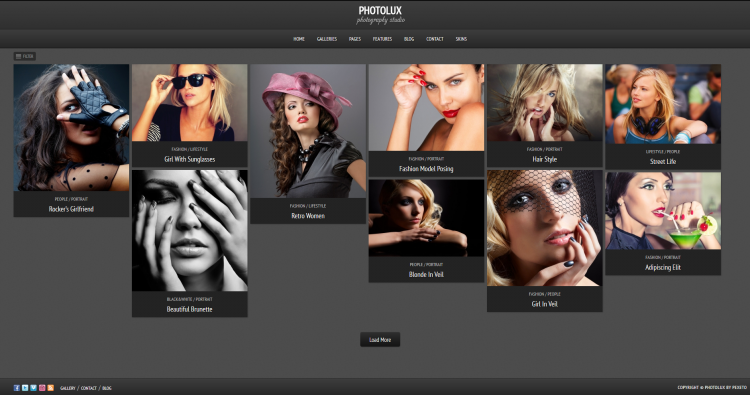 Photolux is powered by the advanced Pexeto Panel which provides lots of options to manage and modify any aspect of the theme. This is both well suited for beginners with little coding knowledge and developers alike. The basic three skin choices are light, dark & transparent. But, there are numerous options to customize your backend and/or build your own skin. 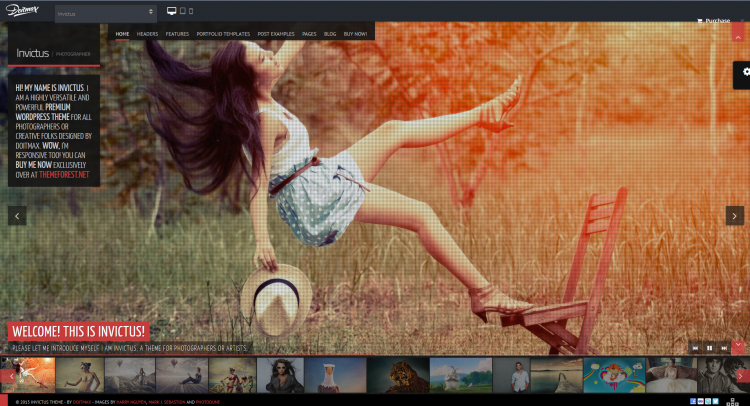 Check out a theme purchased by over 7,000 people now. If you like general creativeness or photography and are looking for a new, interesting way to display your work then this theme is really for you. There are video tutorials to guide you through creating everything you need if you are new to WordPress. 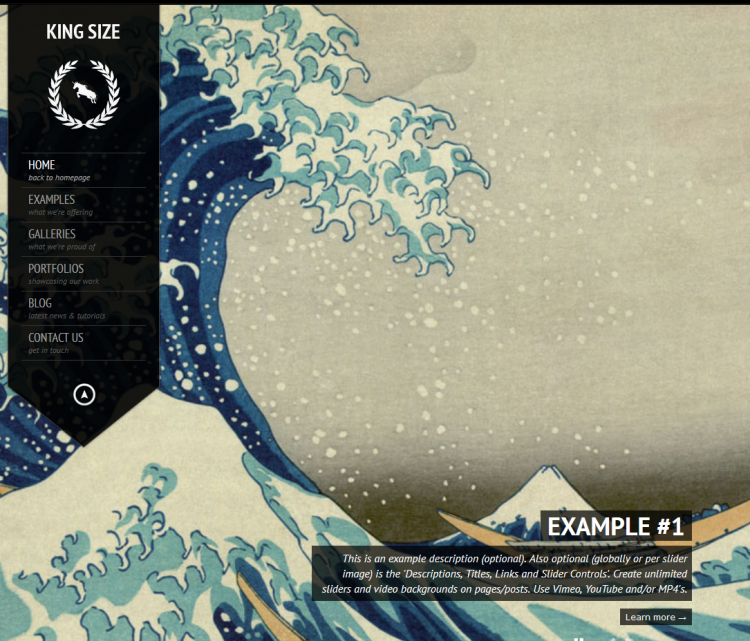 This theme also has many helpful hints throughout to let you know how everything works. There are many different unique full screen sliders to suit all kinds of images including: slideshow with right navigationfor both landscape & portrait thumbs, slideshow with floating navigation for both landscape & portrait thumbs, slideshow with no cropping, slideshow with no thumbs. Village has an incredible gallery manager that allows you to upload 100’s of photos with just a few simple clicks. You can choose between 1 and 4 columns in each gallery including: prettyPhoto gallery, fancybox gallery, colorbox gallery & galleria gallery. If you’re looking for an awesome full screen wordpress theme give village a try now.